– Join us at 4pm on opening day for our special ribbon cutting ceremony with the Mayor of Bremerton and other friends and sponsors of the market. – The kick off of our 2019 Kids Market Bucks Programming! Our first activity is opening day (4pm – 7pm), we will be learning all about soil! The club is open to kids 3yrs – 12yrs and emphasizes healthy eating and active living. Kids who complete the weekly activity will be issued $4 in Kids Market Bucks to spend at our farm vendors on fresh fruits, veggies, and edible plant starts! – Enjoy local Music performed by Kalan Wolfe under our Music at the Market tent. 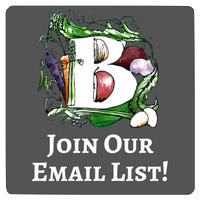 – Shop local with your favorite market vendors! 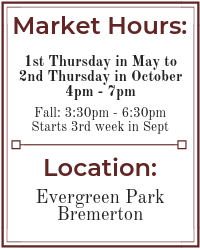 Bring yourself, your family and your friends and come out to enjoy the kick off of another amazing market season! Visit our Facebook event page and spread the word! Leave a comment Opening Day 2019! We are all sad to see the season end, but LOVED seeing everyone down at Evergreen Park every week and supporting our local farmers and artisans! Thanks to all of our loyal customers — you help us make the market happen! Come down to Evergreen Park today from 3:30pm to 6:30pm and join us in bidding farewell to a great market season, get your last market fix in before the long winter, and shop LOCAL! For EBT card users you still have time to spend those tokens and Fresh Bucks. Make sure to take advantage of the abundance of fresh fruits and veggies that will be at market our last week. We hope to see you all at market!!! Leave a comment Oct. 11th – LAST MARKET OF THE SEASON! Just 2 markets left this season! Don’t miss out on the abundance that our farmers have in store for you today, Oct. 4th from 3:30pm to 6:30pm. We will be at Evergreen Park with farm fresh goods, artisan crafts, delicious hot foods, AND our last installment of the Kids Market Bucks Club. See you today at market!!! Music: Middle School students from Klahowya Secondary School will be performing at market today! Leave a comment Just 2 Markets Left! Last Yoga at the Market for the Season! Just 3 markets left this season! Get out to Evergreen Park today from 3:30pm – 6:30pm (Fall Hours) and get all the local goodness you can while it lasts. Our farmers are bringing an abundance of produce, chicken, duck eggs, honey, flowers and more just for you. Once you are done shopping, stick around for our last installment of Yoga at the Market happening at 5:45pm in the open green space behind our vendor booths. A HUGE thank you to The Movement Studio at the Chiropractic Lifestyle Center for hosting this amazing community event every month this season. Hayton Farms Berries – Last week at market! Don’t miss out on your last chance to get blackberries and strawberries! Museables – Featured Specials include Fall & Winter Wear Hand Crocheted Hats for Women, Men & Children. Infinity Scarves, Ear Warmers And Adorable Mermaid Tail Handbags. Leave a comment Last Yoga at the Market for the Season!